Originally, built not for looks, but as necessary transportation, the rat rod has made a resurgence in popularity. These cars started popping up in the U. S. In the late ’40s and early ’50s, being the less expensive than their hot rod counterparts. They were unfinished as far as interior and paint, but ran. Today they are built to look similar to those from yesteryear, but perhaps it takes a little work to get that unfinished look just right. Now there cars are built to look like those from the 1950’s and ’60s. And, many of the parts are that old. Of course, the cars have to be street-worthy, but they don’t have to look it. The engine works and the frame is sturdy, but there may be no bells or whistles. They have the powerful engines of old-fashioned cars, may use a lot of gas and may be pretty noisy to ride in. Fanciers suggest making them from scratch. You can pick up a pretty inexpensive frame or body at most any wrecking or junk yard. Of course, the older the model, the more it may cost. It can be most any brand, Chevy, Ford, Buick or a foreign make. The body will need to be gutted and then redesigned in any fashion desired. And you can resize it, making a two-seater into only one, or raising or lowering the ride. You’ll then need to pick or build an engine. If this is all new to you, you may want to purchase a rebuilt engine that is ready to go. While it doesn’t have to be the same model or make as the body, it does have to fit, or you’ll have to adjust the frame to make it fit. You will need the right size driveshaft, or readjust one to properly fit. The wheels and rims can be anything you want and just add tires. Finish it how you want. Get a steering wheel and other interior parts you desire. Don’t forget seatbelts. And voila, you have your rat rod. You can paint it, but you don’t have to, as these cars are known for that unfinished look. Rat rods are often found in car shows and parades all around the country. There are also fancier clubs in all most every region and for online chat. Because of their regained popularity, there are complete cars and parts available on many websites and online auctions. And, they don’t have to be cars, there are rat rod trucks and motorcycles as well. 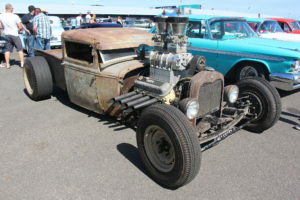 Like other car enthusiasts, the rat rod can be a fun hobby and perhaps, not as expensive as other types of vehicles. It is a great way to learn about cars and how they are built and a good way for fathers and sons, brothers and friends, to spend time together. They make a great project in a high school or college auto class and you turn out with something functional as well. Get the low down on reasons why rat rods are back in fashion now in our guide to all you need to know about popular rat rods . Part of the reason Classic Cars Online US exists is to help connect classic car buyers and sellers, and we’ve added several ways for you to connect, but first, be sure to visit the Classifieds page if you’re in the market to buy or sell a rat rod.